I've said it before and I'll say it again, I feel like every week, I'm bringing you something new in plus size, which is just SO exciting, and this week is no exception. 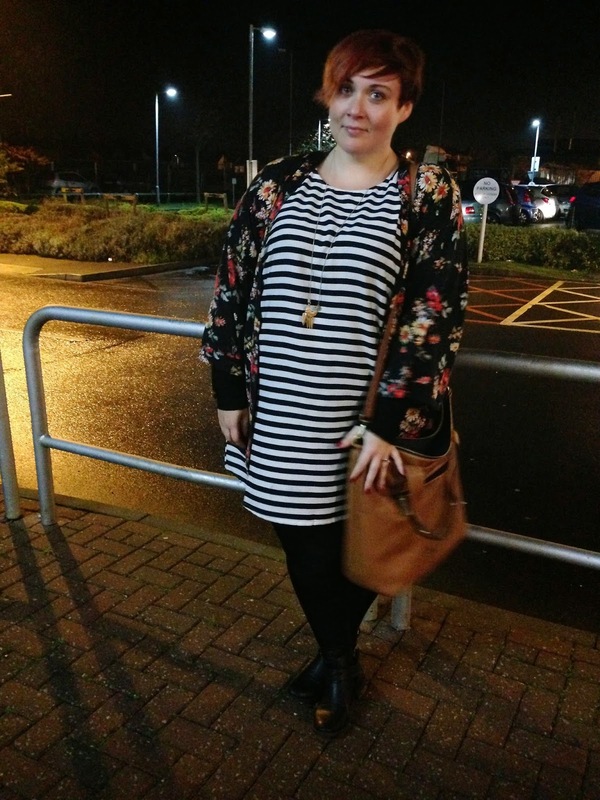 House of Fraser launched their plus size offering around eight months ago now (so not all that new, but new to this blog anyway!) They offer a one stop shop for a whole host of plus size brands, the beauty of which is, if you've got your eye on a couple of items from different brands, you can shop them in one place and only pay one postage fee (postage is free over £50 anyway and they offer a click and collect service). I headed over to the site and chose an item to review, after much browsing, I went with a stripe dress from Evans. 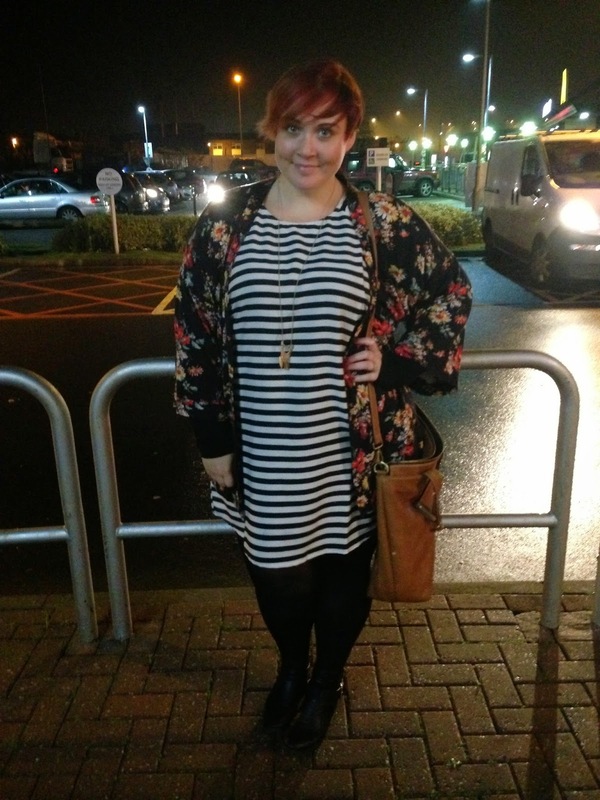 Carpark chic, it's where it's at. I found the website really easy to navigate and there was lots of choice from brands like Junarose, Evans, Taking Shape, Marina Rinaldi and Lipstick Boutique. I went for this simple striped dress from Evans in the end. I thought it would be super versatile and great for layering up, which is exactly what I've done here. The dress itself isn't exactly what I was expecting. It's a very thin viscose and size-wise luckily I had the foresight to size up because I had a feeling it wouldn't be generous. I'm wearing the 24 which is fine on my size 22 body, I'd say though if you have a rounder tummy or larger bust you might want to go up two sizes. I wore a long sleeve black jersey top underneath with opaque tights and a floral kimono on top. I'm interested to see how this dress washes, these pics were taken after we'd been out to grab something to eat and I don't know if I'd left a baby wipe on my knee or dropped some water, but the stripe pattern weirdly went a bit smudgy, so I'm waiting with baited breath to see if the whole lot just runs in the wash! I know, I'm really selling this garment aren't I?! What is important though is that the House of Fraser website is really easy to use, the range of brands and variety of choice is great and there are some HoF own brand pieces in there like Label Lab and Therapy, so it's definitely worth checking out.